Your photo is printed directly onto brushed aluminum Dibond with a BUTLERFINISH® look. The result is eye-catching: The areas of the photograph that are white or very light are not printed, but instead take on the appearance of the brushed aluminum's surface. This new, exquisite presentation format is particularly suited to fans of modern architecture, graphic design, and technology, providing a new option for presenting their images effectively. 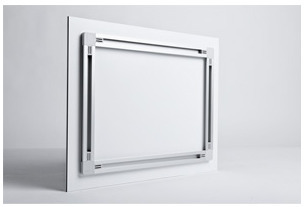 This product stands out for aesthetic reasons, but the material is also extremely robust and durable. Whether inside or in covered outside areas, your work has the best protection against elements such as direct sunlight, extreme temperatures, and humidity. Thanks to the brushed surface, the aluminum backing gives your photos an extraordinary, metallic appearance. During production of the cover sheet, the surface is ground horizontally to produce a brushed effect. 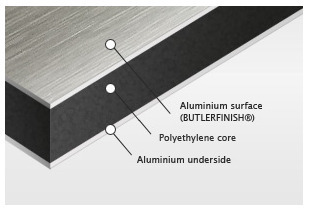 Once your image has been printed on the BUTLERFINISH® surface, we then create a wafer thin seal using a clear resin that retains the matte effect of the aluminum Dibond backing. Any areas of the image that are white or very light are not printed. As with all other products from the WhiteWall photo lab, if you choose the direct print on brushed aluminum, you have complete freedom with regards to format. You can choose anything from mini to panoramicto circular works - all available in the size of your choice. Minimum size: 3.5"x3.5" Maximum size: 75"x57"
Are you a fan of cool industrial aesthetics, contemporary design, or metallic materials? If so, this is the ideal presentation for your pictures – especially for photographs with a large amount of white, for those with strong black-and-white contrasts, and for graphic designs - these float expressively on a metallic background. In architectural photography, façades stand out sharply on the reflective, matte BUTLERFINISH®. Discover the diverse presentation options available for your image, as well as the unique effect of brushed aluminum. 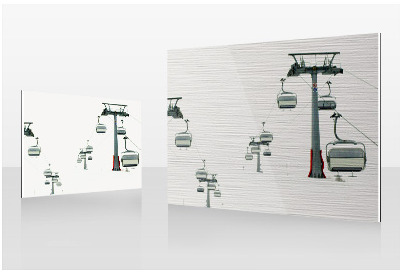 Your image is printed directly onto a 0.12", sturdy aluminum backing. 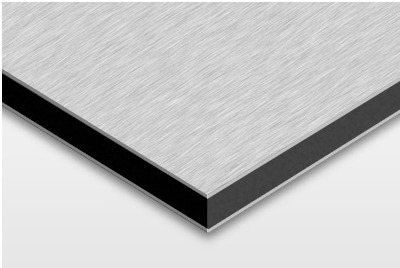 Two thin aluminum sheets sandwich a black polyethylene core to ensure maximum stability and water resistance. The upper aluminum layer, on which your photo will be directly printed, has the characteristic BUTLERFINISH® appearance. This aluminum construction has proven itself in galleries for over a decade and is far superior to fragile foam boards and other discount solutions. For this, WhiteWall relies on the quality of German brands, using a Wolfram CNC cutting machine to ensure the edges are cut and ground with precision. 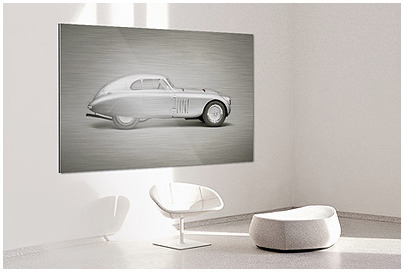 WhiteWall's direct UV-print is colorfast, light resistant, and even moisture-proof. 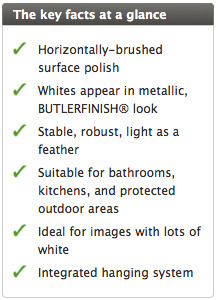 Your photo on brushed aluminum Dibond is therefore not only suitable for indoor areas such as the bathroom or the kitchen, but also for protected outdoor areas. Our latest UV art print technology guarantees extreme durability and stability: Through UV exposure, every print is dried six times. The aluminum Dibond backing is extremely light, and our practical hanging system ensures it is easy to hang on the wall, even with large formats. As with all of the gallery finishes from the WhiteWall photo lab, we always produce your direct print on brushed aluminum together with the hanging elements, regardless of the size you choose. Simply unpack your picture, hang it up, and let it add its floating, metallic look to your wall.